For its first episode of the 2017, Gotham certainly didn't disappoint. This week's spring premiere -- titled "Ghosts" (more on the significance of that later) -- holds tightly to the narrative development promised by the show's previous episode. 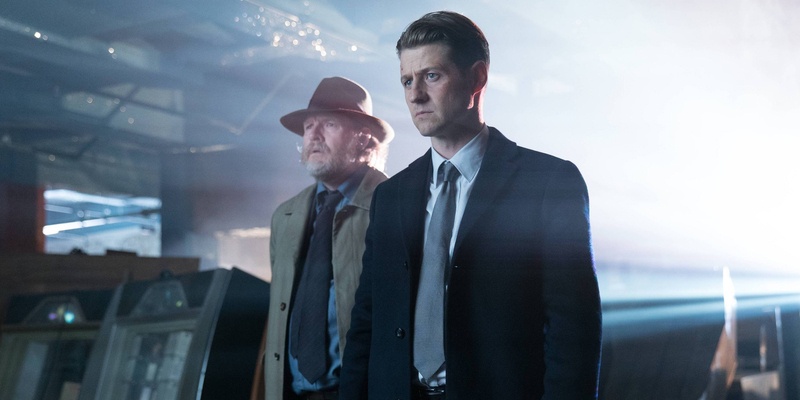 Following Mario's death in the final seconds of the fall finale, Gordon (Ben McKenzie) now finds himself the target of both Falcone (John Doman) and Lee (Morena Baccarin), while Penguin (Robin Lord Taylor) witnesses the surprising return of his father, Elijah Van Dahl (Paul Reubens). There's also the reunion between Selina (Camren Bicondova) and her long-estranged mother Maria (Ivana Milicevic). As if all that wasn't enough story to keep viewers occupied, "Ghosts" also begins teeing up the much-anticipated return of proto-Joker Jerome Valeska (Cameron Monaghan). While the fan-favorite character has yet to receive the full-on resurrection treatment, Gotham has revealed that his madness has developed a literal cult following. It's a storyline that fans have been waiting for ever since Jerome was shockingly killed off mid-season 2. Not only was the character perhaps an early incarnation of arguably the greatest comic book villain of all time, Monaghan's impassioned performance proved to be one of the series' highlights. For a show with so many baddies running amok, that's saying a lot. So let's discuss the return of Gotham more in-depth, shall we? It's telling that the very first scene of this episode so directly contrasts with the final shot of the previous one. While the first half of Gotham season 3 ended with Gordon gunning down Mario to protect Lee, "Ghosts" starts with the cop surveying Mario's funeral from a distance. In fact, the episode remains fairly focused on the consequences of Gordon's action, even as it threads in a sort of prologue to Jerome's return. Lee's fit of rage against Gordon may cause longtime fans to roll their eyes ("You're the real virus, Jim.") -- considering that the show seems once again fascinated by Gordon's "dark side" -- but at least Falcone's short-lived hit on Gordon opened the doors for Anthony Carrigan to return once again as Victor Zsasz, a bright spot in an otherwise lackluster follow-up to the fall cliffhanger. Gordon's never been nearly as interesting a character as the writers think he is, leaving this storyline somewhere between predictable (Lee's still in love with Gordon, of course) and overly tidy (Falcone cancels the hit on Gordon because... reasons). Even if the Gordon/Falcone/Lee story left fans wanting, at least the case Gordon and Bullock (Donal Logue) were investigating kept things interesting. Whenever fans of DC Comics projects see David Dastmalchian pop up, let's all just assume he's either an admirer or a pawn of the Joker. After all, the character actor appeared as a mental patient working for the Clown Prince of Crime in The Dark Knight. Here he is revealed to be the figurehead of an underground cult inspired by Jerome's exploits. They even know his chilling video message by heart, we discover in the episode's most memorable moment. Gotham has sporadically hinted at the larger effect Jerome has had on the city, but we finally got to see what that entails. As it turns out, Jerome's followers are secretly toying with reanimation, hoping to bring their hero back to life. This does appear to contradict the brief sound of Jerome's laughter in the closing moments of season 2, though fans likely can overlook that lapse of continuity if it means we get Monaghan wreaking havoc again. You have to hand it to Ed (Cory Michael Smith). Even without his signature green jumpsuit, the character is a more effective super-villain than anyone else on the show. With his supreme intellect, the man is a genius at systematically tearing apart someone's life. Although it may not have taken someone of Ed's caliber to realize that he was likely behind Penguin's misfortune, the "how" of it all took a bit more work. In a slick move, Gotham snuck the return of Clayface (Brian McManamon) in this episode, with the shape-shifting baddie slipping into the disguise of Penguin's dead father. The fact that Clayface/Elijah was able to so easily sneak around city hall (grasping a bloody murder weapon, no less) is a bit far-fetched, but it's still within believability for a show as unabashedly bonkers as Gotham. As Lucius (Chris Chalk) points out, "impossible" no longer feels applicable to this city. Seeing Penguin suffer puts Gotham fans in an awkward position. On the one hand, the character certainly has it coming, and his journey has been essentially defined by a cyclical rise to and fall from power each season. Yet, Taylor is so much more fun to watch when he is on top, gloating pompously to the rest of the ensemble and forcing his will upon them. Now that he's embarrassed himself to his constituents (another development, like his mayoral candidacy, that feels ripped right from Batman Returns), it'll be interesting to see if Gotham can sustain his continued suffering or run out of ways to keep Ed's plan firmly in motion. In any case, the turn wherein Penguin commits murder just as his interview began was a delicious bit of television. He always has been ruled by his emotions in a way that Ed has rarely allowed himself to be, to the point that he developed something of a split personality as a result. Here's hoping that the show keeps Penguin and Ed locked into this battle of wits until season's end. Both characters are devious and cunning, and once Penguin gets wise to Ed's motives, it will put him into the dilemma of overcoming his romantic feelings for him. Since Gotham began, Selina has been a character both defined and restricted by her emotional baggage. It's wise then that the show brings in her estranged mother just as Bruce is looking to take their relationship to the next level. While Maria Kyle is still a character shrouded in mystery, her reunion with Selina led to some memorable moments this week, notably when Selina realizes that the box of belongings her mother wanted her to have is actually a bunch of mementos from Selina's childhood. That's the level of emotional intimacy that we rarely get from the show. Moreover, the character development aspect of this storyline is critical since there isn't much going on narratively at the moment. Selina struggles with her mother's return, yes, but the Court of Owls mystery has slowed to a crawl, with simply a brief mention and a glimpse of the ornament the court had been protecting. It appears to reveal some kind of a map, though we're betting that Gotham dangles that carrot out until the season finale. It wouldn't be the first time a plot point was held back until the last possible moment. In fact, it's a pattern that Gotham has frustratingly resorted to time and time again. Perhaps by the time season 3 ends, fans will have seen at least some forward motion on the Court of Owls tale. Gotham continues next Monday with "Smile Like You Mean It" at 8PM on FOX.